I was in secondary school when I first saw an investment scam. On my way home from school, I came across a small crowd excitedly surrounding a rough looking man who was dealing cards in a game called “pata potea”. Some people in the crowd were encouraging others to “invest” in the game, boasting how much “profit” they themselves had made. Here, we look at how investors sometimes lose their money in investment scams and how you can avoid becoming one of them. Please CLICK HERE to watch on You Tube. In the last few years, there has been a dramatic increase in the level of awareness about personal finance issues among the general public. Many people are finally waking up to the fact that it is important to save and invest if one is to have a financially secure future. Unfortunately, this increased awareness has also generated a huge opportunity for investment scam artists who prey on these new and inexperienced investors. Investment scams are like hydra-headed monsters, as soon as one is shut down, another reemerges. One of such scams is a “Ponzi” scheme or pyramid scheme as its more commonly known. A Ponzi scheme, named after Charles Ponzi, a perpetrator of one of the first and most gigantic of such schemes in the 1920s in America. In this kind of scheme, the administrator convinces people that he is running a legitimate and highly profitable business. Investors are then invited to put in their money and are promised huge returns, sometime even that they will double their money in one or two months. As word of the wonderful “investment opportunity” spreads, many people rush to invest “before it is too late”. After a while, the whole operation collapses and the administrator slinks away with the loot, leaving thousands of people minus their life savings. Please CLICK HERE to watch on You Tube. Usually, there is no real business being operated. They may pretend to be in the land buying business, finance or some secretive but highly profitable operation. However, that is just a cover. All the swindler does is pay off earlier investors with money coming in from new investors while at the same time siphoning off chunks for himself. While the operation is still small and people have confidence in it, things roll along quite fine. But then it becomes increasingly difficult to recruit new investors who are desperately needed to keep it going, investors begin to ask uncomfortable questions and the whole thing comes crashing down. Modern operators of pyramid schemes have become very sophisticated in the marketing of these scams and it is often difficult to tell if an investment is a pyramid scheme. They aim at soft targets, such as the religious faithful who unquestioningly swallow anything they are told by any authority figure who has been accorded a platform by their leaders. When you are promised a monthly return of ten percent, it is equal to a hundred and twenty percent annually, which is sky-high return on investment. Any prudent person would wonder what type of business would be generating such a high return consistently, yet needs to borrow to finance its operations. And what industry are they in that they have unlimited capacity to grow since they are borrowing on unlimited and growing basis? So long as people have money to give them, they will take that money and it will also generate the same high return. Doesn’t the law of diminishing returns apply to them? Wake up, before you lose your money. Please CLICK HERE to watch on You Tube. 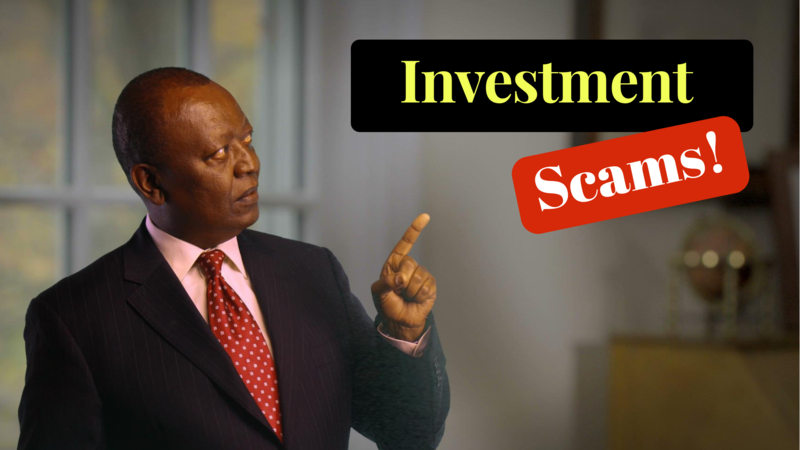 There is often an air of secrecy about the whole “investment opportunity” and one must be introduced by an old member. This creates an image of exclusiveness that whets the appetite of prospective investors and makes them even more enthusiastic about joining. Remember, you have already been made to understand that the whole objective of the project is to empower people who belong to a particular segment of society. How can a scheme with such noble objectives be wrong? Basic business reasoning shows that there is something not quite right with these kinds of schemes. Besides, if it is that easy to make money, all the investment professionals including investment analysts, fund managers, investment advisors and stockbrokers should be sacked and these new experts given their jobs. If you are offered an investment opportunity, ask yourself if it makes business sense, if the promoters are credible and have a track record, if the promised returns are in line with comparable investments, if the risk is acceptable to you and if you are protected by government agency regulation. Is there a market for the investment or how easily can you liquidate your investment? If it is a business opportunity, does the product make economic sense in terms of the price or is it grossly overpriced and bolstered with a “story” to justify its ridiculous price? Are you required to recruit others to join the opportunity? This is always a red flag. Swamped with glowing testimonials of how super successful other participants are including being sent photos of holidays in exotic places and expensive cars they purportedly own? Bottom line; Money is not easy to earn but you can lose it in a flash with investment scams. Don’t attempt to get rich quickly by investing in such schemes. Please CLICK HERE to watch on You Tube.